TSC Industrial direct thermal/thermal transfer printers of the MH240 Series from TSC are excellently suited for printing in warehouses and logistics. The standard version of the robust printers print labels up to 114 mm wide at a resolution of 203 dpi – for even more detailed print results, up to 600 dpi is possible.The 4.3'' touch panel (depending on the model) with its intuitive handling clearly shows you all the necessary information and messages at a glance. 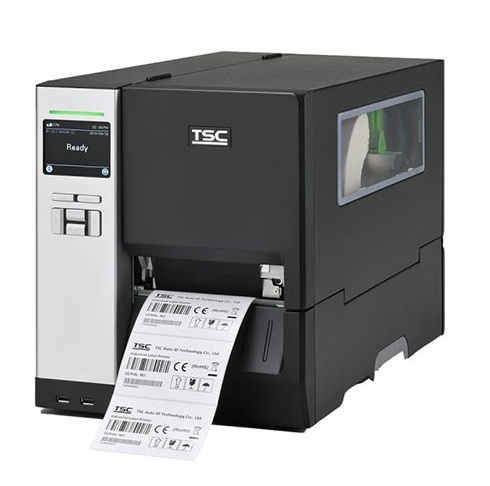 TSC Industrial direct thermal/thermal transfer printers of the MH240 Series from TSC are excellently suited for printing in warehouses and logistics. The standard version of the robust printers print labels up to 114 mm wide at a resolution of 203 dpi – for even more detailed print results, up to 600 dpi is possible. The 4.3'' touch panel (depending on the model) with its intuitive handling clearly shows you all the necessary information and messages at a glance. For even simpler handling all models of the MH240 Series additionally offer six function keys. An LED with two different colors informs you of the devices' current status. The optional near-end sensor shows you the consumables capacity directly on the display and lets you know in time when the media roll is nearing the end – this reduces unexpected downtimes to a minimum. You may also exchange both the print roller and print head in a matter of seconds, and without any tools. All models of the MH240 Series have two USB ports on the front, for comfortably connecting peripheral devices, such as a keyboard or barcode scanner. Additional interfaces on the rear connect the printer to the host: here you have your choice between RS232, Ethernet or USB 2.0. WLAN, parallel and GPIO are optionally available ex works, or as separate interfaces. Direct Thermal Labels for Industrial Printers, Size: 102mm x 102mm - Direct Thermal (DT) Die-Cut Standard Labels for Industrial Printers, Size: 102mm (width) x 102mm (height), White Uncoated Paper, Permanent Adhesive, Outside Wound on 3.0" (76mm) core, Maximum Outside Diameter 8.0" (203mm), Perforated, 1500 per Roll, 4 Rolls per Box. Total Labels per box 6000. Price per Box. Direct Thermal Labels for Industrial Printers, Size: 102mm x 200mm - Direct Thermal (DT) Die-Cut Standard Labels for Industrial Printers, Size: 102mm (width) x 200mm (height), White Uncoated Paper, Permanent Adhesive, Outside Wound on 3.0" (76mm) core, Maximum Outside Diameter 8.0" (203mm), 750 per Roll, 4 Rolls per Box. Total Labels per box 3000. Price per Box. Direct Thermal Labels for Industrial Printers, Size: 102mm x 52mm - Direct Thermal (DT) Die-Cut Standard Labels for Industrial Printers, Size: 102mm (width) x 52mm (height), White Uncoated Paper, Permanent Adhesive, Outside Wound on 3.0" (76mm) core, Maximum Outside Diameter 8.0" (203mm), 2750 per Roll, 4 Rolls per Box. Total Labels per box 11000. Price per Box. Direct Thermal Labels for Industrial Printers, Size: 57mm x 32mm - Direct Thermal (DT) Die-Cut Standard Labels for Industrial Printers, Size: 57mm (width) x 32mm (height), White Uncoated Paper, Permanent Adhesive, Outside Wound on 3.0" (76mm) core, Maximum Outside Diameter 8.0" (203mm), 4500 per Roll, 8 Rolls per Box. Total Labels per box 36000. Price per Box. Direct Thermal Labels for Industrial Printers, Size: 102mm x 152mm - Direct Thermal (DT) Die-Cut Standard Labels for Industrial Printers, Size: 102mm (width) x 152mm (height), White Uncoated Paper, Permanent Adhesive, Outside Wound on 3.0" (76mm) core, Maximum Outside Diameter 8.0" (203mm), Perforated, 1000 per Roll, 4 Rolls per Box. Total Labels per box 4000. Price per Box. Direct Thermal Labels for Industrial Printers, Size: 102mm x 76mm - Direct Thermal (DT) Die-Cut Standard Labels for Industrial Printers, Size: 102mm (width) x 76mm (height), White Uncoated Paper, Permanent Adhesive, Outside Wound on 3.0" (76mm) core, Maximum Outside Diameter 8.0" (203mm), Perforated, 2000 per Roll, 4 Rolls per Box. Total Labels per box 8000. Price per Box. Direct Thermal Labels for Industrial Printers, Size: 38mm x 25mm - Direct Thermal (DT) Die-Cut Standard Labels for Industrial Printers, Size: 38mm (width) x 25mm (height), White Uncoated Paper, Permanent Adhesive, Outside Wound on 3.0" (76mm) core, Maximum Outside Diameter 8.0" (203mm), 5500 per Roll, 12 Rolls per Box. Price per Box. Total Labels per box 66000. Price per Box. Direct Thermal Labels for Industrial Printers, Size: 38mm x 38mm - Direct Thermal (DT) Die-Cut Standard Labels for Industrial Printers, Size: 38mm (width) x 38mm (height), White Uncoated Paper, Permanent Adhesive, Outside Wound on 3.0" (76mm) core, Maximum Outside Diameter 8.0" (203mm), 3800 per Roll, 12 Rolls per Box. Price per Box. Total Labels per box 45600. Price per Box. Direct Thermal Labels for Industrial Printers, Size: 50mm x 25mm - Direct Thermal (DT) Die-Cut Standard Labels for Industrial Printers, Size: 50mm (width) x 25mm (height), White Uncoated Paper, Permanent Adhesive, Outside Wound on 3.0" (76mm) core, Maximum Outside Diameter 8.0" (203mm), Perforated, 5000 per Roll, 8 Rolls per Box. Total Labels per box 40000. Price per Box. Direct Thermal Labels for Industrial Printers, Size: 70mm x 32mm - Direct Thermal (DT) Die-Cut Standard Labels for Industrial Printers, Size: 70mm (width) x 32mm (height), White Uncoated Paper, Permanent Adhesive, Outside Wound on 3.0" (76mm) core, Maximum Outside Diameter 8.0" (203mm), 4500 per Roll, 12 Rolls per Box. Total Labels per box 54000. Price per Box. Direct Thermal Labels for Industrial Printers, Size: 76mm x 76mm - Direct Thermal (DT) Die-Cut Standard Labels for Industrial Printers, Size: 76mm (width) x 76mm (height), White Uncoated Paper, Permanent Adhesive, Outside Wound on 3.0" (76mm) core, Maximum Outside Diameter 8.0" (203mm), 2000 per Roll, 8 Rolls per Box. Total Labels per box 16000. Price per Box. Direct Thermal Labels for Industrial Printers, Size: 83mm x 140mm - Direct Thermal (DT) Die-Cut Standard Labels for Industrial Printers, Size: 83mm (width) x 140mm (height), White Uncoated Paper, Permanent Adhesive, Outside Wound on 3.0" (76mm) core, Maximum Outside Diameter 8.0" (203mm), 1100 per Roll, 4 Rolls per Box. Total Labels per box 4400. Price per Box. Thermal Transfer Labels for Industrial Printers, Size: 102mm x 200mm - Thermal Transfer (TT) Die-Cut Standard Labels for Industrial Printers, Size: 102mm (width) x 200mm (height), White Semi-Gloss Paper, Permanent Adhesive, Outside Wound on 3.0" (76mm) core, Maximum Outside Diameter 8.0" (203mm), 750 per Roll, 4 Rolls per Box. Total Labels per box 3000. Price per Box. Direct Thermal Labels for Industrial Printers, Size: 76mm x 51mm - Direct Thermal (DT) Die-Cut Standard Labels for Industrial Printers, Size: 76mm (width) x 51mm (height), White Uncoated Paper, Permanent Adhesive, Outside Wound on 3.0" (76mm) core, Maximum Outside Diameter 8.0" (203mm), Perforated, 2750 per Roll, 8 Rolls per Box. Total Labels per box 22000. Price per Box. Thermal Transfer Labels for Industrial Printers, Size: 102mm x 102mm - Thermal Transfer (TT) Die-Cut Standard Labels for Industrial Printers, Size: 102mm (width) x 102mm (height), White Semi-Gloss Paper, Permanent Adhesive, Outside Wound on 3.0" (76mm) core, Maximum Outside Diameter 8.0" (203mm), Perforated, 1500 per Roll, 4 Rolls per Box. Total Labels per box 6000. Price per Box. Thermal Transfer Labels for Industrial Printers, Size: 102mm x 152mm - Thermal Transfer (TT) Die-Cut Standard Labels for Industrial Printers, Size: 102mm (width) x 152mm (height), White Semi-Gloss Paper, Permanent Adhesive, Outside Wound on 3.0" (76mm) core, Maximum Outside Diameter 8.0" (203mm), Perforated, 1000 per Roll, 4 Rolls per Box. Total Labels per box 4000. Price per Box. Thermal Transfer Labels for Industrial Printers, Size: 102mm x 52mm - Thermal Transfer (TT) Die-Cut Standard Labels for Industrial Printers, Size: 102mm (width) x 52mm (height), White Semi-Gloss Paper, Permanent Adhesive, Outside Wound on 3.0" (76mm) core, Maximum Outside Diameter 8.0" (203mm), 2750 per Roll, 4 Rolls per Box. Total Labels per box 11000. Price per Box. Thermal Transfer Labels for Industrial Printers, Size: 102mm x 76mm - Thermal Transfer (TT) Die-Cut Standard Labels for Industrial Printers, Size: 102mm (width) x 76mm (height), White Semi-Gloss Paper, Permanent Adhesive, Outside Wound on 3.0" (76mm) core, Maximum Outside Diameter 8.0" (203mm), Perforated, 2000 per Roll, 4 Rolls per Box. Total Labels per box 8000. Price per Box. Thermal Transfer Labels for Industrial Printers, Size: 38mm x 25mm - Thermal Transfer (TT) Die-Cut Standard Labels for Industrial Printers, Size: 38mm (width) x 25mm (height), White Semi-Gloss Paper, Permanent Adhesive, Outside Wound on 3.0" (76mm) core, Maximum Outside Diameter 8.0" (203mm), 5500 per Roll, 12 Rolls per Box. Total Labels per box 66000. Price per Box. Thermal Transfer Labels for Industrial Printers, Size: 38mm x 38mm - Thermal Transfer (TT) Die-Cut Standard Labels for Industrial Printers, Size: 38mm (width) x 38mm (height), White Semi-Gloss Paper, Permanent Adhesive, Outside Wound on 3.0" (76mm) core, Maximum Outside Diameter 8.0" (203mm), 3800 per Roll, 12 Rolls per Box. Total Labels per box 45600. Price per Box. Thermal Transfer Labels for Industrial Printers, Size: 57mm x 32mm - Thermal Transfer (TT) Die-Cut Standard Labels for Industrial Printers, Size: 57mm (width) x 32mm (height), White Semi-Gloss Paper, Permanent Adhesive, Outside Wound on 3.0" (76mm) core, Maximum Outside Diameter 8.0" (203mm), 4500 per Roll, 8 Rolls per Box. Total Labels per box 36000. Price per Box. Thermal Transfer Labels for Industrial Printers, Size: 70mm x 32mm - Thermal Transfer (TT) Die-Cut Standard Labels for Industrial Printers, Size: 70mm (width) x 32mm (height), White Semi-Gloss Paper, Permanent Adhesive, Outside Wound on 3.0" (76mm) core, Maximum Outside Diameter 8.0" (203mm), 4500 per Roll, 12 Rolls per Box. Total Labels per box 54000. Price per Box. Thermal Transfer Labels for Industrial Printers, Size: 50mm x 25mm - Thermal Transfer (TT) Die-Cut Standard Labels for Industrial Printers, Size: 50mm (width) x 25mm (height), White Semi-Gloss Paper, Permanent Adhesive, Outside Wound on 3.0" (76mm) core, Maximum Outside Diameter 8.0" (203mm), Perforated, 5000 per Roll, 8 Rolls per Box. Total Labels per box 40000. Price per Box. Thermal Transfer Labels for Industrial Printers, Size: 76mm x 51mm - Thermal Transfer (TT) Die-Cut Standard Labels for Industrial Printers, Size: 76mm (width) x 51mm (height), White Semi-Gloss Paper, Permanent Adhesive, Outside Wound on 3.0" (76mm) core, Maximum Outside Diameter 8.0" (203mm), Perforated, 2750 per Roll, 8 Rolls per Box. Total Labels per box 22000. Price per Box. Thermal Transfer Labels for Industrial Printers, Size: 76mm x 76mm - Thermal Transfer (TT) Die-Cut Standard Labels for Industrial Printers, Size: 76mm (width) x 76mm (height), White Semi-Gloss Paper, Permanent Adhesive, Outside Wound on 3.0" (76mm) core, Maximum Outside Diameter 8.0" (203mm), 2000 per Roll, 8 Rolls per Box. Total Labels per box 16000. Price per Box. Thermal Transfer Labels for Industrial Printers, Size: 83mm x 140mm - Thermal Transfer (TT) Die-Cut Standard Labels for Industrial Printers, Size: 83mm (width) x 140mm (height), White Semi-Gloss Paper, Permanent Adhesive, Outside Wound on 3.0" (76mm) core, Maximum Outside Diameter 8.0" (203mm), 1100 per Roll, 4 Rolls per Box. Total Labels per box 4400. Price per Box.